We all make mistakes in life. Making a mistake is part and parcel of life. Be it in personal or professional life, we make a lot of wrong decisions which cost us in some way or the other. So if this is true, how should you minimize the loss suffered by you due to these mistakes? Every mistake has a cost. So we should look at minimizing this cost. The cost of making a mistake rises exponentially with time. The longer you keep making a mistake, the more it will hurt you. This is the exact philosophy behind what we say ‘Going Lean’. Keep assessing your actions so that you can figure out quickly when you have made a mistake. Making the same mistake for long can seriously affect some part of your life. 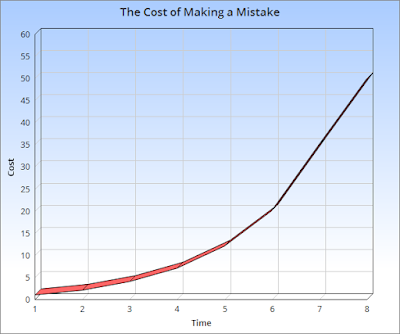 In your business, a long duration mistake will have accelerated actual and opportunity costs attached to it. In personal relationships, the longer the mistake, the bigger the dent it leaves. The same goes for any addiction as well. The longer you are addicted to anything harmful, the effects keep on getting accelerated over time. Making mistakes is not wrong. Making them for very long is!